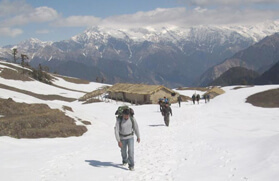 Offering a trail perfect for the beginners in trekking, Jalsu Pass Trek is one of the most sought-after excursions in Himachal Pradesh. 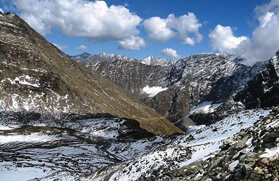 Jalsu is one of the eastern most Dhauladhar Passes positioned at about 3450 meters above the sea level. 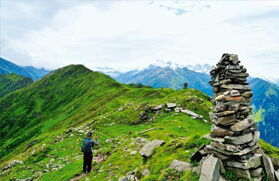 Its gentle sloping trail is one of the extensively used Shepherd routes by the Gaddi Tribes of Himachal Pradesh. Like other Dhauladhar passes, Jalsu outlines the margin between Chamba and Kangra districts, but unlike other Dhauladhar passes, its exquisiteness is not in the bareness and rockiness but in the assortment of foliage it supports and hues it displays on both sides. 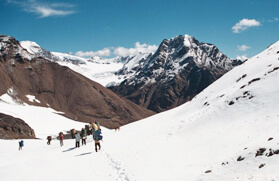 The trekkers can also meet swarms of shepherds, shopkeepers, and tourist's en-route. This exhilarating trek starts from Bharmour and makes the tourists visit several startling regions like Suri, Yara Goth, Utrala and of course Jalsu Pass. 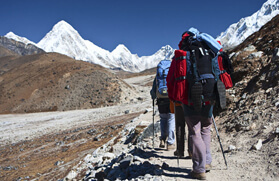 This 09 nights and 10 days itinerary take the tourists on a pleasant and heart-warming trekking trip of Jalsu Pass. This trek is ideal for beginners and calls the adventure enthusiasts from all over the blue planet to explore the surreal beauty of nature in the midst of wit-relaxing tranquillity. Take an overnight train to Pathankot from Delhi railway station. Overnight train journey. On arrival at Pathankot train station meet our executive and transfer to Dalhousie which will take 3-4 hrs. On arrival at Dalhousie, check into the hotel. In the evening, visit local sight seen of Small Hill station Dalhousie. We will proceed to visit the Kalatop wildlife sanctuary after breakfast in the morning and then to Khajiyar. Enjoy the beauty of Mini Switzerland and take lunch in the afternoon. After lunch, we will move to Bharmour via Chamba. After reaching Bharmour, check in to the hotel. In the evening, join the Aarti at Chaurasi temples. An overnight stay at the hotel in Bharmour. Today, we will leave early in the morning after breakfast and with packed lunch and trek to Bharmani Temple, which is situated at the ridge and is 03 km trek from Bharmour. In the evening, return back to Bharmour and check into the hotel for an overnight stay. After breakfast early in the morning, we will move through taxi to a small beautiful town Holi for sightseeing. After lunch, we will go to Nayagram village and then to Laakewali Mata where road head will ends. 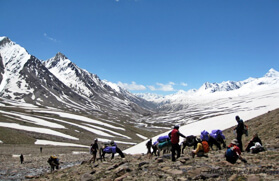 From Laakewali, the actual trek will start to Jalsu Pass. A run of 2 km will reach a small village Surie. A trek of one hrs will reach the final destination of the day. An overnight stay and dinner will be provided in tents. Today, we will leave early in the morning after breakfast and move to the next destination i.e. Yara Goth. Yara Goth is 08 kms trail from Surie. There are sprawling, sloping grasslands, a generous sprinkling of deodars on the way, lots of dark green Rhododendron bushes. 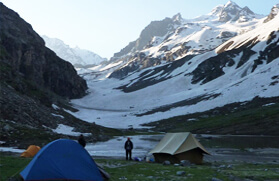 Hence, the forest is dense provide calm climate to trekkers and rear glimpse of Himalayan Thar, Serrows, Musk Dears, etc. The whole area is also famous for Medicinal plants, shrubs and climbers. After a run of 4-5 hrs, the trail reaches at Yara Goth. Enjoy lunch here and spends the rest of the day in the Goth and gets acclimation for next day journey. Enjoy dinner and an overnight stay in the camp. 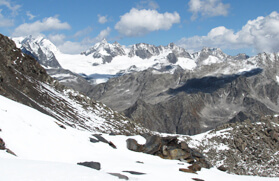 After breakfast in the early morning, we will move to Parie over Jalsu Pass. This is a 13 kms trail from Yara Goth. Parie is a small village with a primary school. The residents are frequent visitors to Yara Goth where they have improvised huts for temporary stay for grazing their flocks. 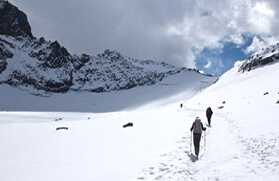 Jalsu Pass is an accessible pass and is easy to cross for trekkers and tourists who take part in any adventure activities often cross this pass. Here, the local people establish seasonal tea stalls to help the trekkers and pilgrims. Enjoy dinner followed by an overnight stay in the camp at Parie. On the last day of our tour, we will move from Parie to Utrala after breakfast. This is a 16 kms trail from Parie village. 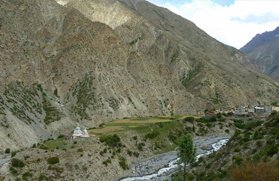 In the start, the trail will goes downward along with Parie Nallah and need a gentle climb. 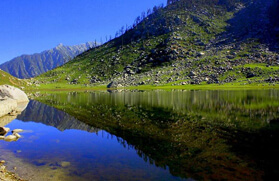 A trek of 4 hrs will reaches at Utrala Village in Kangra district of Himachal Pradesh. From here we will drive to Andretta which is an artist village. Check in to guest house for night stay. In the morning after breakfast explore the Andretta artist village and later drive to Dharamsala which will take 2 hrs approx by car, from here catch AC Volvo bus for Delhi. Overnight journey. Arrival at Delhi by morning in between 07:00 - 08:00 hrs.